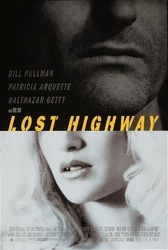 Patrick and JB transform into different people in order to deal with the bizarre violent and sexual imagery that is David Lynch's underrated 1997 movie Lost Highway. Wow, intelligent commentary on Star Wars, Blade Runner, and Lost Highway? What more could you ask for! - As the youngling that I am, I actually watched the "Final Cut" of Blade Runner before I watched any of the versions with the narration, and I have to admit I did think some of it was confusing the first time I saw it, but only on a narrative level (i.e. who is that woman Han Solo is chasing? ), whereas I think it's always been clear at a thematic level. - The idea that Lynch pulls things out of his films to make them more abstract reminds me of Terrence Malick, who shoots immense amounts of footage and then drastically cuts it down in the editing room. It's interesting that you then mention Tree of Life, which you didn't like. Maybe it's just a matter of personal taste/connection/whatever. Hello Patrick! A longtime listener from L.A. here. I've gushed to you before and will gush again about how much I dig the show. Came looking for this as Twin Peaks has lit a fire under me to rewatch all of my Lynch movies and I'm getting a message that says the site can't be reached for this particular episode. Is there an alternative way to download? Thanks! Thanks for the nice words! I'm on a big Lynch kick as well. I think I fixed this episode, so try downloading again. It should work now. Gracias and much obliged. Also digging on folllowing junesploitation. Thanks again!